And That, Ming-Mai, Is Why I Pretended Not To See You At The Bus Stop. Well, I’m averse to death and peril, and long falls – I have learned through the generations – seem to be connected to death and peril, and as such I am careful. This is a proportional response. A phobia is an irrational fear. Not a fear, not a disproportionate fear. Refusal to go up a few floors in a building could be a phobia of heights. Getting short of breath and panicky thinking about having to climb a ladder up onto the roof of the house could be phobia, but is more likely a disproportionate fear – a reaction to something risky in which the reaction outweighs the possible risk. That I will be in a public toilet, lean over it and something (my keys, my sunglasses) will slip out and fall in the toilet. This is a fairly rational fear because there’s a proportional degree of chance (I tend to hook my sunglasses over the front of my shirt, which lends itself to falling) and response (I spend zero time thinking about this if I’m not in the situation, and my fear of it occurring is at the same level of losing my sunglasses in some other way). That I will bite into an olive that I think has been pitted, but hasn’t, and I’ll chip a tooth. Disproportionate fear. Not a phobia, as I still eat olives – I love olives. However, should you and I ever find ourselves eating olives together, and the olives have pits, I will – I assure you, I will – say to you at some point as you reach for an olive, “They have pits. Just so you know.” This scenario is unlikely (the tooth-chipping I mean; I’d be delighted to have olives with you), but still within the realms of possibility. But it actively concerns me, beyond the rational. It is not a risk to the extent that everyone needs individual warnings. Carnival rides. Phobia. Why? Because they terrify me, purely in their own right. Whenever it comes up (and it does annually, thank you County Fair), people run through the list: “Is it because you throw up? Because you think they’re unsafely constructed and maintained? Are you afraid you’ll fly off the tracks in to space?” No. No but that’s a good point. Thirdly, no, that would actually make the ride a little more appealing to me. I’m not afraid of the rides because of anything, I’m just terrified of them. I was looking at some photos (photos!) 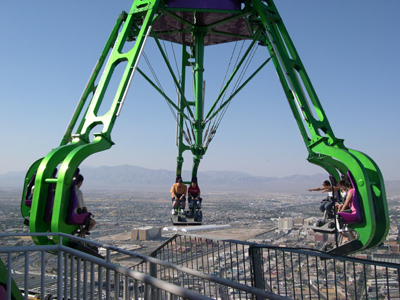 of the rides on the roof of that casino-hotel in Las Vegas and started getting anxious and short of breath. Irrational. I also have this one extremely weird fear, which is this: that I will see someone I think I perhaps casually know, someone who is of Asian ethnicity. I will go say hello and discover that he or she is someone else, someone I don’t know. This person will then assume that I got them confused because I think that ‘all Asians look alike,’ when in fact this person really does look whoever I thought it was. But he or she will not believe me. Yes, I actually fear this. This has never happened to me. I’m astonishingly bad with names, so I tend to avoid using people’s names (a pathetic habit, only slightly better than giving everyone nicknames to hide the fact that you don’t learn names), but I’m pretty good with faces. So why does this concern me? I don’t know. It’s not a phobia, because it doesn’t paralyze me, I don’t avoid befriending people of Asian descent. It’s certainly not rational, though. Disproportionate, maybe? But disproportionate to what? It’s never happened to me! I suppose I have the same fear with anyone, regardless of ethnicity, it’s just that it doesn’t carry the same baggage of racial stereotyping and ignorance. If I were reading this, I would probably think, “Oh well, deep down you’re afraid that you do think Asians all look alike, and this buried racist thought scares you.” And then I’d feel very smug and astute. Well, wipe that smirk off your face, because that’s not it; I think it probably has more to do with being afraid of being in one of those situations where you’ve accidentally said something not just dumb, but potentially hurtful, and the more you try to explain it, the worse it gets. Who knows. And yet there it is. It serves no real purpose, yet controls this tiny, tiny corner of my behavior. Fear has been the greatest savior and greatest impediment in my life. It fascinates me. Maybe that’s why I have all these categories and subcategories? Because I’ve gotten to know it so well? I can’t just lump it all together as “phobia.” You have to have not spent much time with something to be unable to see the degrees of differences, be it snow, be it fear, be it ethnic groups. Love it! I’m afraid of carnival rides but only because I rode them with childlike pleasure up into my drunken 20s when I could actually see bolts missing from OBVIOUSLY important parts. I became very still/ quiet til the end of the ride and haven’t gotten on one since. So, that may be a phobia I’ve developed but it’s not that I see them and shudder–just I sure as hail ain’t getting on one again. I like life. Fun twist on the Asian thing (especially since I’m coming from reading the Long Duk Dong piece). I live in fear of mispronouncing Gaelic words.